SKY Perfect JSAT Corporation (Head office: Minato Ward, Tokyo; Representative Director, President & CEO: Shinji Takada; hereinafter “SKY Perfect JSAT”) has reached a business partnership agreement on March 28, 2019 with PASCO CORPORATION (Head office: Meguro Ward, Tokyo; President & CEO: Dr. Hideki Shimamura; hereinafter “PASCO”) with the goal of creating high added-value services and mutually making effective use of the technologies and resources owned by both companies in the wide range of fields from the satellite to geospatial data business, while also seeking increased efficiency for the low-earth-orbit (LEO) satellite-based services currently offered by both companies and expanding the markets for these services. 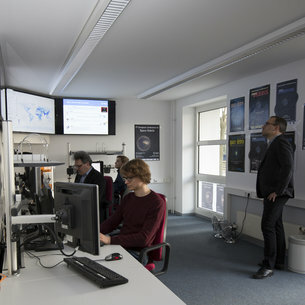 1) Satellite ground station services Utilize the applied technologies, expertise, and resources owned by both companies to expand the earth observation business of SKY Perfect JSAT, while also expanding business by offering network services with the ground stations for LEO satellites in Japan and in other countries for earth observation and telecommunications companies. 2) Satellite data utilization Begin developing new services by mutually making effective use of the earth observation satellite data and services of both companies. ■ Social background On May 29, 2017 the Japanese government published its “Space Industry Vision 2030,” and now considers the space industry to be one of the growth industries driving the “Fourth Industrial Revolution” in Japan. Since the costs associated with the production and launch of satellites have been dramatically decreasing, the potential markets that utilize satellites has been growing. Private companies have also been entering the market in the domain of these services. These companies, including startups, have already begun launching satellites and offering satellite launch services. Against this backdrop, SKY Perfect JSAT and PASCO have entered into business partnership in order to mutually utilize their respective advantages while bolstering their initiatives in new business fields to accommodate such ever-growing “New Space” field of satellite utilization.